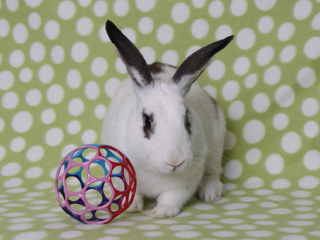 Dillon is a large 8lb bunny boy– He is currently at a shelter and his time is running out. He is litter box trained and a nice, neutered rabbit. He is about 1 yr old. In his shelter community they just do not appreciate large rabbits. Larger rabbits at this shelter rarely find homes. He also has very little space there and it is starting to wear him down. He is getting depressed. He has been at the shelter for 5 months. That is a very long time for a rabbit. If you want to help rescue this bunny please call me- 831 239-7119. We can make all necessary arrangements for his release and can get him to you. (Within a 100 mile radius of San Jose CA) Dilly needs a loving indoor home with plenty of space to romp and play. He will blossom if he can just get out into a loving home soon. Please bring Dillon home for the holidays and forever after.